It’s not often that I can introduce you all to an Emmy Award Winning news reporter – turned blogger, on my blog! But today I’m excited to have Candace from Vintage News Junkie for today’s Feature Friday! 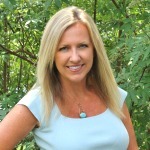 Please welcome Candace to Sand & Sisal! Happy Friday, Sand and Sisal friends! Can you believe it’s already November?! My name is Candace and I blog over at Vintage News Junkie. I was stoked when Kim asked me to stop by! I am an Emmy Award Winning former news reporter who now blogs full time about my life, my home, and all my DIY adventures. You can read more about me and the slumber party I had with my Emmy Award here! So now that we’re best buds… let’s get to business! Today, I am sharing my cute ‘lil wood block pumpkins. I made them from old pallets I picked up for FREE on craigslist! Kim knows her way around a free pallet or two… remember the ones she had leftover from her New Patio… and that stinkin’ cute Wood Pallet Shark she made!! L-O-V-E!! I love a good free upcycle! This project came to be when the hubs and I were making a Mini Picket Fence for our Fall Home Tour. I wanted something grand for the mantel without a grand price! So we ran for the garage and started tearing apart some old pallets we had on hand. It really was that easy and we ended up with a boat load of wood. Most of it was the traditional long boards you are used to seeing, but then there were these big chunky blocks that came from the middle of the pallet. I knew I wasn’t going to toss them, but I wasn’t quite sure where they would end up. I kept my thoughts to myself as we began working on our little picket fence… when we cut the tops of the fence posts, I had an ‘ah-ha’ moment! You see that little scrap of wood??? Are you thinking what I’m thinking? That’s a pumpkin stem… duh! That’s when I knew the destiny for my chunky wooden blocks. We took the blocks and cut all four corners, to create a sort of hexagon shape.. no wait! 1..2..3..4..5..6..7..8.. it’s an octagon! I picked out several of the taller ones… and broke out the twine. I started at the bottom of the stem. Add a drop of hot glue and wrap the stem about half-way up. Then another drop of hot glue holds it in place. Once the stems were done.. I needed some leaves. I had some faux leaves leftover from our Fall Front Porch, so I snagged a couple of those and an old book. This part was a little bit tricky, but patience is the key. It’s not going to be perfect, but that’s why I like it!! I traced two leaves per pumpkin. I even grabbed a real one from the front yard that had a pretty shape. Once all the leaves were cut, I rolled them up in different directions to curl the edges a bit. That gave them a nice 3-d effect. I hot glued the leaves on top in different directions and hot glued the stem on top of that… and voila!! I hope you enjoyed this little upcycle! It was super fun to make! If you like upcycled projects, you may like my DIY Kitchen Shutters. I made them from Ikea Bed Slats! Or perhaps my Burlap Wreath Video Tutorial… nothing beats upcycling a thrift store wreath from the 80’s!! Thank you so much, Kim, for introducing me to your friends!! Thank you so much, Martina! These are just adorable-I love them!! Thanks so much for the tutorial! Thank you, Melissa! So happy that you like them!! Ooohhhh, I’m a sucker for anything made from a pallet … especially something I’ve never seen before! Such a creative idea, Candace! Thanks for sharing! !